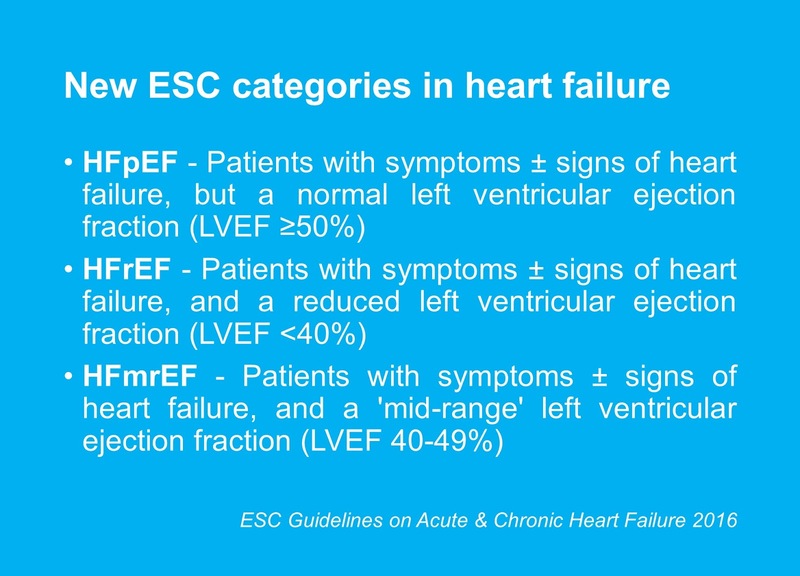 Andrew R. Houghton: The ESC's new heart failure terminology: HFmrEF anyone? 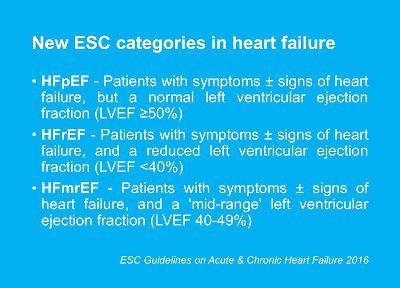 The ESC's new heart failure terminology: HFmrEF anyone? In the last few days, the European Society of Cardiology has released its latest guidelines on the management of acute and chronic heart failure. An update of the ESC's last guidelines (which were published in 2012), the new 2016 document contains several changes which will be covered in forthcoming blogs. The categories of HFpEF and HFrEF have been recognised for several years, but the category of HFmrEF is new. Why has this group of patients been highlighted as a separate group? Well, the ESC argues that those with a mid-range LVEF (40-49%) are a 'grey area', where the benefits of heart failure therapies on morbidity and mortality have not been so conclusively proven as in the HFrEF (LVEF <40%) group. The ESC argues that identifying patients with HFmrEF as a new group will help to stimulate research into the characteristics and management of this 'intermediate' category of left ventricular systolic dysfunction. In its discussion on terminology, the ESC also advises against using the terms 'preserved systolic function' or 'reduced systolic function' This is because patients with HFpEF often have subtle abnormalities of systolic function, and most of those with HFrEF have evidence of diastolic dysfunction. Thus the terms HFpEF, HFrEF (and, of course, the new term HFmrEF) are now preferred by the ESC. I happen to attend the ESC HF 2016 conference at Florence. I was confused by the recently launched guidelines, with the new terminology of HFmrEF ( EF between 40-50). While the world over effort is to simplify guidelines, these new categories would surely confuse the treating clinician. Would the treatment endpoints different in this category, would different drugs be required. If not then why to complicate the treatment protocol, by introducing another new category, with no simple directives to clinicians, for this group. Remember the old JNC VI hypertension guidelines with many different classes of hypertension, instead of helping a physician, they were highly confusing and did not help in treatment. Ultimately, the subsequent HT guidelines, had to simplify the categories. Similar would be the fate of this new class. In this global world, we now have three different sets of HF classification , one by ACC/AHA, other by British Heart Failure Society, and now these ESC-HF Guidelines, all with different cutoffs of different categories. Yes, I agree that there does seem to be a risk of confusion. I do however think that the EF 40-49% cases need more research - most heart failure trial data comes from those with an EF <40%, so more studies are needed in the 'mild impairment' group. So hopefully the new HFmrEF will stimulate new research in this category.